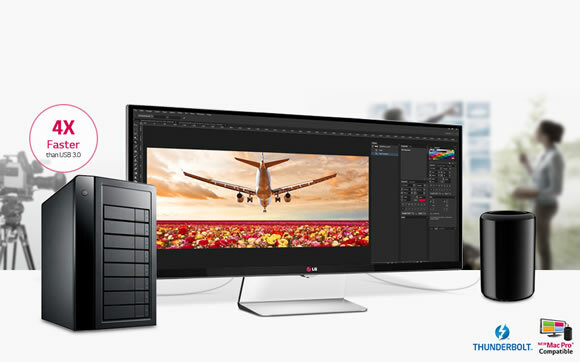 Designers rejoice, LG has just launched a groundbreaking display that changes the game of big, beautiful displays. This 34 inch masterpiece is as beautiful as it is powerful, and is the perfect companion for web designers, graphic designers, photographers and anyone else who creates digitally. I use dual monitors now, why do I care about this? What often frustrates the designers is lack of color consistency when moving images from one monitor to another, which ultimately adds strains to rely on one (high-end) monitor as referencing color fidelity. 34UM95 supports expressing over 99 percent of the sRGB color space, meaning, you have a solid color range. On top of that, you no longer have to worry about how the same image will look on the other side of the bezel (next monitor), as all the work can be done in one monitor. LG‘s own True Color Finder software and built-in scaler also robustly sustains color consistency round clock, across all of your images. If there was such thing as a golden ratio for a single monitor, 3440 x 1440 QHD resolution would definitely be a candidate. Big monitors should never sacrifice vertical pixels for width. With legacy screen space, photographers had to juggle image files and folders fighting for space with the images they were actually working on. With a 21:9 ratio packed with dense pixels, there is ample space for Photoshop, which can handle more images than before, and toolbars, which can claim a space of their own. its a nice looking monitor and the internal color software sounds good. Not really 100% convinced about the form factor, also with using a tablet in mind. Is this an advert? It certainly reads like one. Very, VERY similar article over at the webdesignerdepot. Now I may be being cynical (and regardless of the merits of what looks like a nice monitor) but is this article also sponsored? Because I can’t see it mentioned anywhere. An accident? Why can’t people appreciate good products simply for the sake of appreciating good products? C’mon, guys. Enjoy life. Advertising only works if there’s trust. If someone writes a ‘review’ of a product we need to be able to trust that their opinion is unbiased, not motivated by a pay check. That’s a conflict of interest. If it’s such a good product, advertisers shouldn’t need to rely on underhand tactics such as bribing reviewers.